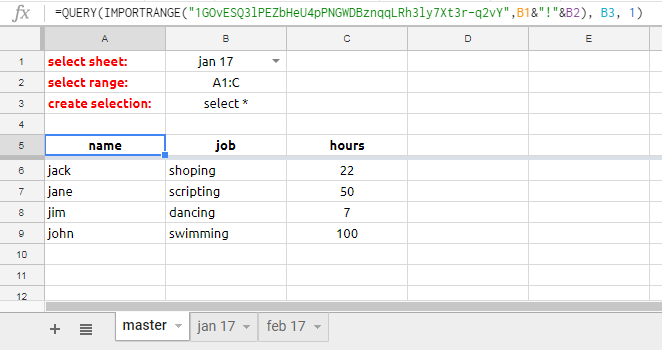 We use Google Sheets for tech commission sheets (track jobs and hours). Right now we have 2 years (2017&2018) in 1 set of sheets, 1 sheet for each month (jan 17, feb 17, etc). So instead of adding more sheets, I would like to just create a new set of sheets for 2019 but I need to be able to pull/search for data from the 2017/2018 sheets to ensure a tech doesn't accidentally pay themselves for a job twice. Is this possible? And if yes, how can I do it? Not the answer you're looking for? Browse other questions tagged google-sheets formulas search or ask your own question.